Please call for scheduling parties or for more information. DHA is a type of sugar, that when applied to the skin, causes a natural chemical reaction with your amino acids to produce a tan without being exposed to the sun. You can plan on being with your Airbrush Spray Tan Tech for 20 – 30 minutes for your service. After explaining to your Tan Tech the color you are looking for, you will undress to your comfort level (disposable bra, thong and cap can be provided). Club Tan promotes the highest level of confidentiality and privacy between a Tan Tech and his or her clients. Your Tan Tech will walk you through and show you a series of positions to enable you to receive an even, thorough application. What you do before you come in and after you leave will make a huge difference on how much you love your results and if you can maintain it. Using products that contain heavy oils before (in body washes, scrubs, lotions, and even shaving cream and conditioner) will create a barrier between you and your tan. Stay away from oils before you come in. In fact, many oils may strip your tan after the fact as well. Ironically, some lotions designed to give you sunless color (Jergen's Natural Glow) contain these tan stripping oils in order to make you have to use and buy more and more of them! The day before, exfoliate your entire body with a combination of emulsified sugar scrub and exfoliating gloves, spending a little extra time on elbows, knees, feet, and hands. Any waxing or shaving should be performed 24 hours in advance of applying sunless products. Do NOT apply moisturizers, deodorants, antiperspirants, oils, perfumes, or makeup to your skin after you shower as they can create a barrier, preventing the absorption of the tanning solution and affect the tan development. Remove makeup, contact lenses, eye glasses and jewelry. Wear a snug fitting dark bathing suit or your garment of preference to tan in, and loose darker clothing and flip flops to wear afterwards. Schedule your hair or nail appointments prior to your spray tan appointment. Tell your Tan Tech if you have never used a product containing DHA (commonly found in sunless tanners). If you are unsure if you are allergic to DHA, ask for a patch test. To give the tanning solution enough time to work, avoid showering, exercising and other ways of sweating or getting wet (such as washing the dishes, giving your kids a bath, rain, or even letting your dog lick you!) 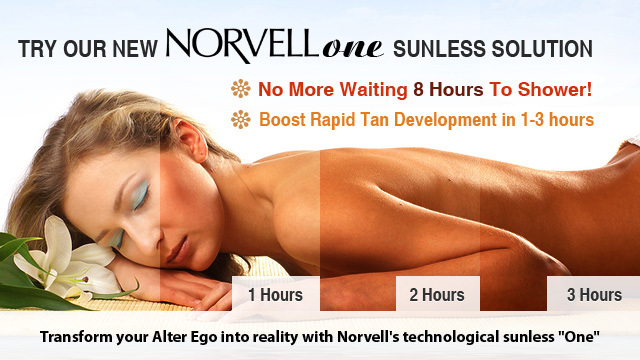 for 18-24 hours, unless using Norvell One solutions, then you would shower in the time frame discussed with your Tan Tech. When you do shower, use a warm water rinse only. The cosmetic bronzer will wash off. Don’t worry! This is not your tan. Mineral Oil: It is a petroleum based skin softener that not only strips your tan but also clogs your pores and has been known to have extreme effects on the skin. This is a common ingredient in cheap lotions (baby oil, cocoa butters, suave, etc.) and is also found in Jergens Natural Glow and others. Avoid it if you'd like to keep your spray tan on as long as possible. Petrolatum: This is also a petroleum based skin softener that clogs pores and strips the tan. This is used much less than Mineral Oil but is prevalent in body butters and really rich body creme washes. It's a cheap ingredient that doesn't lock in moisture, but just makes your skin feel soft. Hydrated skin and soft skin are not always the same thing. Sodium Laureth Sulfate: Also known as SLS, this is the most common ingredient in body washes as it is a pretty strong detergent and lathers well. However, this will strip your tan quicker than anything. Look for products that contain the less harsh Ammonium Sauryl Sulfate or a more natural coconut derived sulfate. Stay away from popular brands such as Dove, Irish Spring, Aveeno, and Oil of Olay. These all tend to strip and streak the tan as well as cause blotchiness. A minimal investment in the right after care products can actually save you money in the long run. We have excellent aftercare products by Norvell, Hempz, and Namaste' that will sustain your tan and keep your skin healthy. After your first shower, moisturize 2-3 times a day. Hydrated skin will maintain a glowing tan best. For additional color, we suggest Norvell 4 Faces Touch-Up Spray or Flawless Sunless Spray between your sunless tan sessions to preserve and maintain your beautiful deep, dark color.